First there were cookbooks, then food blogs, and then subscription meal kits. It’s been fascinating to watch the evolution of home cooking through such recent trends as community supported agriculture (CSA) and farm-to-table restaurants. Meal kits were a game changer that no one was really expecting and they may be one reason farms with CSAs are reporting a drop in memberships. Given the choice of carting home a brimming bag of locally grown cabbage (and figuring out how to use it up) or having an ice-packed, ready-to-cook meal with recipe instructions delivered to your front door – it’s hard to not to pick the latter. 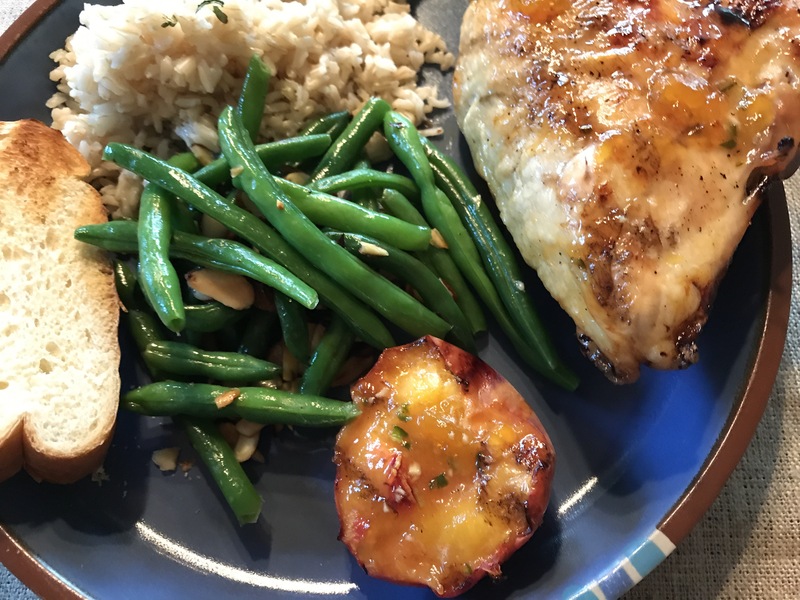 Peach glazed grilled chicken breasts with grilled peaches on the side makes for a delicious summery meal. These crustless mini quiches can be served either as an appetizer or with a simple green salad for a main meal. When the New Year rolls around, I notice an increase in published recipes for legumes – lentils, black beans, black-eyed peas are all popular online searches. This vegetarian chili combines three kinds of beans – red, kidney, and black – nicely into one pot. Welcome to 2017! January’s frosty nights had me hankering for a comforting bowl of homemade chicken noodle soup. Ordinarily I wouldn’t think twice about making a simple soup out of broth, noodles, and a few vegetables. But now that I’m a stepmom to two fairly picky eaters, presenting a homemade meal and having it met with approval or faces that don’t look like I’m asking everyone to eat fried worms has become an achievement on par with completing a triathlon from my single days.